Kevin C. Maki, et al. After decades of research and folk use of the tart fruit, it has now entered into common knowledge that cranberry antibacterial properties are great for treating urinary tract infections (UTIs). A new study has added to that body of evidence, showing that the daily consumption of cranberry juice reduces antibiotics use by making less frequent the occurrence of UTIs in women. The results have been published in the American Journal of Clinical Nutrition. A total of 322 women with recurrent UTIs from different parts of the U.S. and France completed this study, though 373 were originally recruited. Approximately half of the participants consumed an eight-ounce (240-mL) cranberry juice drink every day during the half-year study, while the other half consumed a placebo beverage. The women recorded their cranberry consumption and any UTI symptoms daily. Urine samples were collected at the start of the study and every eight weeks after. Those who took the cranberry juice had nearly 40% fewer UTIs than the placebo group. In other words, only 39 UTIs were diagnosed over the course of the study among the women drinking cranberry juice, compared to 67 in the placebo group, suggesting an inverse relationship between daily intake of cranberry juice and antibiotics. Antibiotic resistance is a growing concern throughout the world, especially in regard to bacteria that tend to colonize the urinary tract. Sometimes, antibiotics are prescribed to patients who have UTI symptoms but do not actually test positive for a bacterial infection, constituting an excessive use of antibiotics. 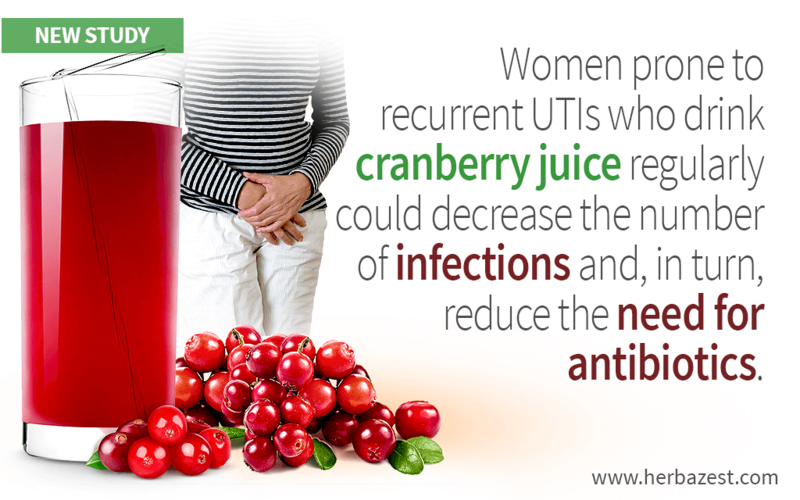 Women who are prone to recurring UTIs could drink cranberry juice regularly to reduce the number of infections they develop and in turn reduce the need for antibiotics as well. It is important to note that this was a study on the incidence of UTIs with regular cranberry consumption, not on treating UTIs with cranberry. In addition, this study was funded by a cranberry juice manufacturer, which represents a potential conflict of interest. Nonetheless, this study is a more solid piece of evidence than previous cranberry research because of its larger sample size and longer duration, and its results uphold the significance of cranberry juice in naturally preventing UTIs.